The main emphasis of the meeting will be on the current status of simulation and software tools in the context of full simulation physics studies for the ILC detector concept studies. The meeting will take place at the Cavendish Laboratory, located in University West Cambridge Site . Although we are trying to keep costs to a minimum it is possible that there will be a small registration fee of 15 pounds (approx 20 Euros/Dollars) to cover the costs of coffee and lunch for three days. The workshop dinner Dinner will take place in the Old Hall, Queens' College on Wednesday 5th April. The cost will be 30 pounds (including wine). When you register please indicate whether you wish to attend the dinner. Relatively cheap accommodation has been reserved in Queens' college (see below) - if you wish to book this, please do so when you register. After 14/03/06 we cannot guarantee accommodation in Queens' college so please contact the organisers directly as there may be a few spare rooms. Accommodation Last date for reserving accommodation in Queens' College : 14/03/06. Accommodation in Cambridge can be expensive and tends to get booked up very early. However, we have reserved 50 rooms in Queens' College . 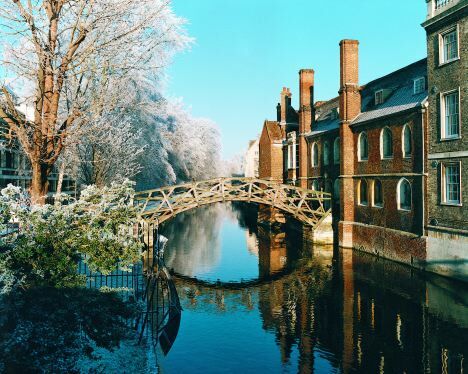 which is located near the centre of Cambridge. Queens' college is conveniently located for the Cavendish: about a 20 minute walk (alternatively there is a door-to-door bus which runs every 15 minutes). Prices for rooms in Queens' college are listed below - these include breakfast. For people who wish to book alternative accommodation, there are numerous hotels/guest houses . Cambridge is easily reached from all London Airports (see the HEP groups travel web page). Once you have arrived it is easy to get around Cambridge on foot. Travelling around Cambridge by car can be very difficult (due to traffic and the highly logical one-way system). 0930-1730 Sessions : Pippard Lecture Theatre, Cavendish Lab. 0930-1400 Sessions : Pippard Lecture Theatre, Cavendish Lab. Details of the workshop dinner and recommendations for restaurants and watering holes can be found here. Cambridge is one of the driest places in the UK - but be prepared for rain (the monthly averages is about 40mm). Wireless Internet access will be available in the Pippard lecture theatre. Please send your wirelss MAC address to drw1@hep.phy.cam.ac.uk. If there are problems please contact Mark Thomson and David Ward by email (thomson@hep.phy.cam.ac.uk,drw1@hep.phy.cam.ac.uk).